Mdskibum and I visited Deep Creek Hot Springs on Sunday October 7, and Monday October 8 , 2018. We hiked in from the Bowen's Ranch. There were more people on Sunday than Monday. We had a great time . I took the temperatures of all of the pools and sources with my digital thermometer. The main source next to the Pacific Crest Trail was 117 F.
The Anniversary Pool was 108 . The Womb Pool was 99 to 100 . The Serenity Pool was 99 to 100 , after alterations it was 101. The Crab Cooker Pool was 110 to 112 . The pipe source for the Crab Cooker was 112 and at the West end source was 110 . The Contemplation Pool was 82. The Phoenix Pool was 108 . The source for the Phoenix Pool was 111. The creek water mid day was 80 to 81. There are multiple small hot sources bubbling up in the creek bottom. The average air temperature in the shade was 71 , on Monday. I first visited Deep Creek Hot Springs was in Summer 1978. I used to visit often throughout the 1980's and the first half of the 1990's. Last time I visited in that decade was October 1996. I had not been to Deep Creek before this last weekend , since October 2001. 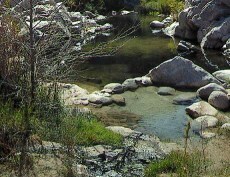 The creek was low , so we were able to dry cross upstream from the Phoenix Pool. the two Pinion Pines at the top of the ridge at this point were dead and one was cut down. This long drought has caused many Pinion Pines to suffer. I took photos , with my cell phone, but do not yet know how to post them yet.